1 package of Puff Pastry, thawed. This takes about 2 hours in the refrigerator. 3 medium sized Heirloom Tomatoes, sliced and prepared as described above. 2 Tbsp Olive Oil, with 1 clove Garlic, crushed. 1/4 tsp Salt, or to taste. 1 tsp Chili Flakes, or as desired. Parchment Paper, cut to fit your rimmed baking pan. Slight overlap is totally fine. Preheat your oven to 375F. Put the oven rack on the center rung. Begin by sprinkling about 1/2 of your AP Flour on the parchment paper. 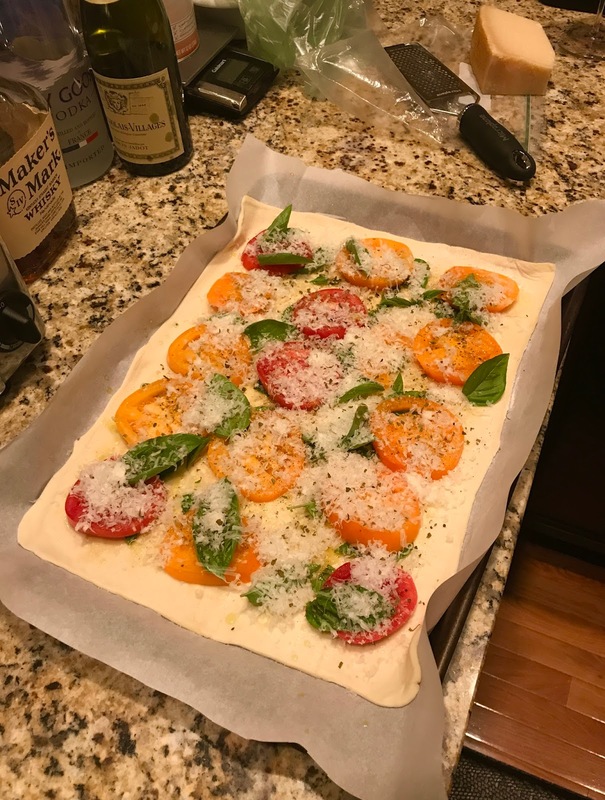 Lie your puff pastry onto the parchment paper, dust your rolling pin and gently roll out the pastry to the proper size, to match your pan. Gently place the parchment paper with pastry onto your baking pan. Brush the pastry with 1/2 of your olive oil mixture. 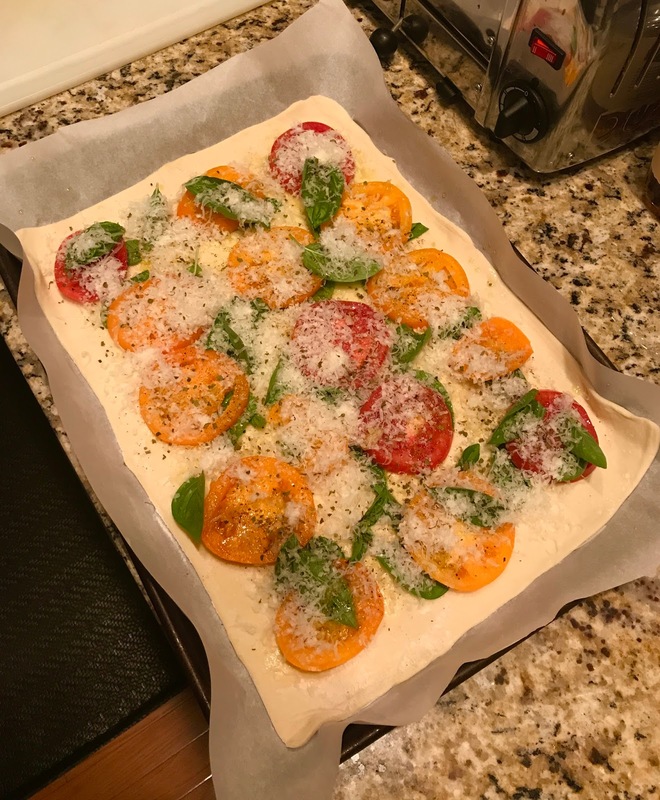 Arrange half of your basil onto the pastry and arrange your tomatoes in one layer. 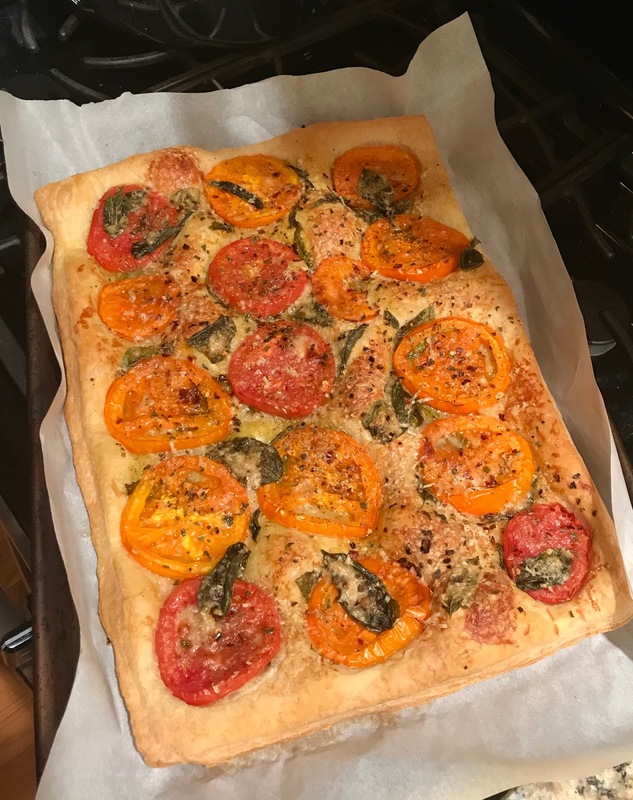 It's okay to overlap slightly if you have extra tomatoes. Add your salt, black pepper and chili flakes. Add the rest of your basil and then drizzle the rest of the olive oil mixture on top and add the Parmesan cheese. Bake following the package directions, but 375F for 30-35 minutes is usually good. Remove from oven, let it rest for 5 minutes and serve.